On 7/27, I got word from an SFACC volunteer that a sick, skinny baby pigeon had come in. He was named Poppy. I contacted shelter staff and they checked on him and put him in an incubator (sick birds need extra warmth). I was able to pick him up on 7/29 and, because the last sick, skinny baby pigeon that I had brought home named Poppy had died, I renamed him Robin. Robin is a baby homing pigeon, too young to have been released for a flight. Perhaps he was sold as squab along with king pigeons and set free. (This seems likely because he has a bit of pink dye on the back of his head and several of the recently rescued kings have been dyed pink.) He was found on Jefferson in SF and was lucky to survive long enough out in the world to get rescued by shelter staff. Robin stayed with me for a short time (shown below sharing a cage with Summer) and then went to foster with another volunteer, Sherri who specializes in caring for some of MickaCoo's sick baby pigeons. Robin did great and made a steady gain in strength and weight. He came back to foster in my backyard coop after having gained 62g. Robin is feisty and, though the smallest bird in the coop, has no problem holding his own. Pigeons are delicate creatures. 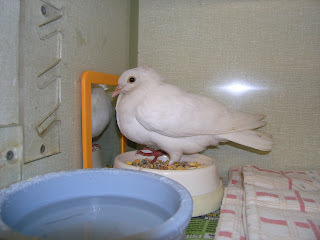 Baby pigeon care and their development need special attention. It is not an easy job.